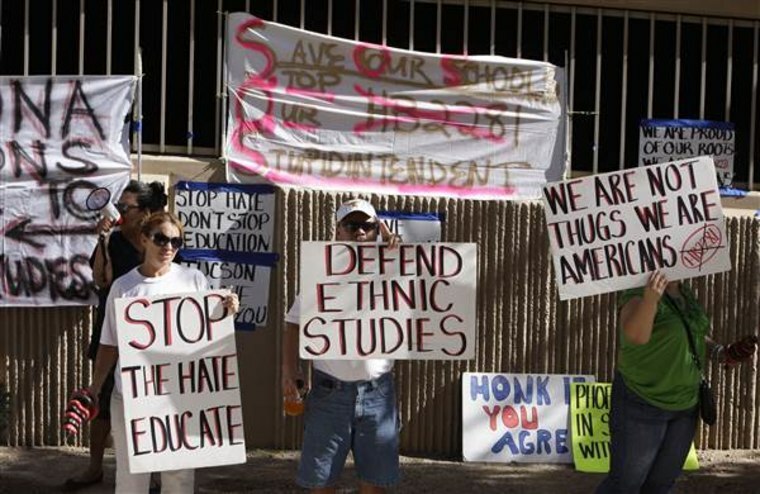 A federal judge said racism was behind an Arizona ban on ethnic studies that shuttered a popular Mexican-American Studies program. U.S. District Judge A. Wallace Tashima found that the state enacted the ban with discriminatory intent. He had previously upheld most of the law in a civil lawsuit filed by students in the Tucson Unified School District. But a federal appeals court, while upholding most of his ruling, sent the case back to trial to determine if the ban was enacted with racist intent. The state violated students’ constitutional rights “because both enactment and enforcement were motivated by racial animus,” Tashima said in the ruling Tuesday. However, Tashima said he doesn’t know a remedy for the violation and has not issued a final judgment. Plaintiffs’ attorneys hoped he would throw out the law, which was enacted in 2010, the same year Arizona approved its landmark immigration law known as SB1070. They have not responded to calls for comment Tuesday evening. Tashima was critical in his ruling of former state education leaders Tom Horne and John Huppenthal, who railed against the program and helped pass the law that ended it. Huppenthal said Tuesday he was not surprised by the ruling and said it was meaningless because the law is not likely to be enforced in the future. “The concern about what was going on in those classes was very real,” Huppenthal said. His new concern “would be if they crank up all that stuff of teaching students that Caucasians are oppressors of Hispanics,” Huppenthal said. The Tucson Unified School District dismantled its program in 2012 to avoid losing state funding. The district hasn’t responded to questions from The Associated Press about whether it would revive the program if the law is thrown out. Horne, the former state attorney general and former leader of Arizona’s public schools, testified in July that he was troubled by what he described as radical instructors teaching students to be disruptive. But he insisted he targeted all ethnic studies programs equally. Some students taped their mouths and turned their back to Horne’s aide, later walking out of the event with their fists in the air, “which is a pretty extremist thing to do,” he said. Horne never visited a Mexican-American studies classroom. He drafted the law as superintendent of public schools and later defended it as state attorney general. “I believe it is a fundamental American ideal that we are all individuals, entitled to be judged by our knowledge and character, and not by what race we happen to have been born into,” Horne said in a statement. The Tucson program began in 1998 and focused on Mexican-American history, literature and art in an effort to keep Mexican-American students in school and engaged. Students who participated outperformed their peers in grades and standardized tests, advocates said. The board of the Tucson school district officially dismantled the program in January 2012 to keep from losing state funding. By 2015, the Tucson district was expanding a “culturally relevant” curriculum developed in the wake of a separate racial desegregation lawsuit. Those courses are now taught at all district high schools, Superintendent Gabriel Trujillo said. He said the district worked with the Arizona Department of Education to ensure the courses don’t violate the state law and are “very scripted,” including offerings such as American history from an African-American perspective.